For those of you who like touring cities on top of a city sightseeing bus, Madrid offers several alternatives. Two companies operate several touristic bus routes. All the details can be found below. 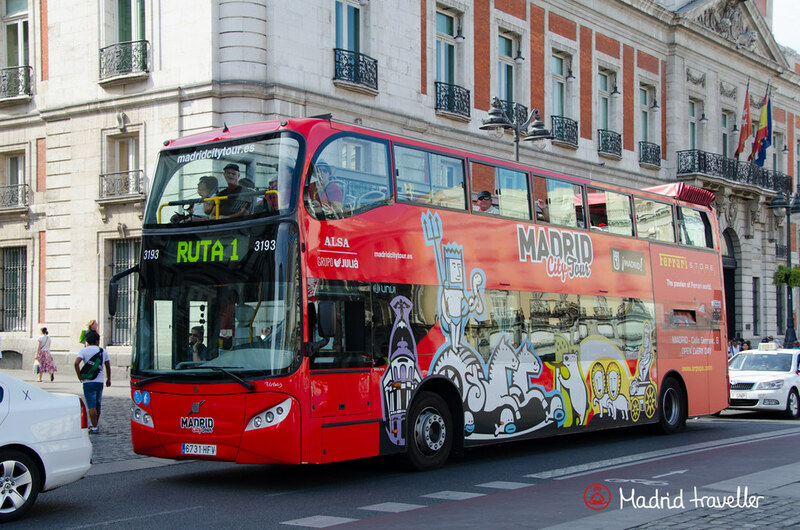 If you are already familiar with open top bus tours, also know as hop on-hop off, the available services in Madrid are pretty much identical as to what you could find in other city across the world. Companies operate one or several routes that include the city’s most important highlights. Each route has a certain number of stops where you can hop on and off the bus. These stops are not always located in the same spot as public transport buses are. You generally catch a double deck bus. These buses offer an audio guide service as well, available in several languages, providing comprehensive comments on the highlight you are visiting. You get a ticket and pay a fixed price. The ticket entitles you to unlimited trips in every route of the company’s buses for a limited period of time – usually 24 or 48 hours. You can hop on and off the bus as many times as you’d like provided that your ticket is still valid. The tourist buses have a limited frequency and chances are you may have to wait between 30 minutes and one hour before the next bus stops where you are. Combine your city sightseeing bus ticket with a Madrid Card to save time skipping waiting lines and take advantage of priory access in the main museums and monuments. Is It Worth To Catch A Tourist Bus? Here are some valid reasons that support the idea of catching a bus to visit a city. 1. An open top bus tour is an interesting idea if you are going to spend little time in town. For example, if you land in Madrid as a first stop before heading south on a road trip around Andalucía. The tourist bus allows you to have a sneak peek of Madrid. 2. If you are going to spend a few days in the city, you might take one of these buses on your first day to have a complete summary of what’s worth visiting. Then, in the following days you can spend time going to the places that interest you more. 3. A double deck bus offers a new perspective compared to what you can see on a walk. 4. It’s worth considering if you’d like to take advantage of the bus route and easily reach far away sights. Like to visit places at your own pace and do not advocate rally-tourism. Intend to a have a relaxed visit of several monuments or museums in one day. Since these buses are not very frequent, you risk wasting a precious time while waiting for the bus to come. Use any other public means of transportation instead. Think about using the tourist bus as a replacement for an unlimited transport pass, such as the Madrid Tourist Travel Pass. It’s not a good idea. A tourist bus ticket is far more expensive than the pass mentioned before or even a Metrobús. Madrid has an excellent public transportation with an extensive subway and bus network. The company operates two routes, the blue one covering the oldest part of the city and the green one, where you get to see the most modern areas. There are also some extended routes and even night routes. There are 37 stops and the entire route takes approximately 80 minutes, and you only need to wait for 30 minutes at every stop for a bus to come. Your tickets are valid for 24 or 48 hours from the first time you use it. The company operates a single route covering highlights of both old and modern areas of Madrid. However, this is not a regular hop-on hop-off service. Once you get on the bus you tour around the streets of Madrid for 1h30. During this time, the bus won’t stop and you are not allowed to leave the vehicle. In my opinion, this is a much less interesting option as you don’t have the freedom to stop as soon as you spot an interesting sight or area of the city. You are forced to see the whole thing and then, come back on your own to explore it. If you are still interested and want additional information, go to Madrid Bus Visión website.